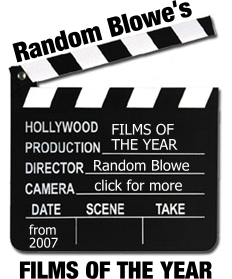 Random Blowe: Space Hijackers Prosecution - Belated April Fools Joke? Space Hijackers Prosecution - Belated April Fools Joke? I'm not sure whether David Leppard of the Sunday Times ran this story in the way that he did simply to print a picture of a fruity woman in a riot helmet flashing a suspender (whatever floats your boat, I guess), or because he is a weird sexist creep. But the continued prosecution of members of the Space Hijackers on charges of impersonating police officers seems ever more farcical. 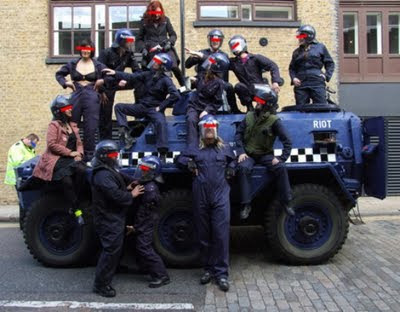 For those who have forgotten, the Space Hijackers' contribution to April’s G20 protests was a old six-wheeled personnel vehicle, complete with speakers blaring out the 'Ride of the Valkyries'. The charges against them make up a substantial proportion of the total prosecutions resulting from events on 1 April, which also make it look all the more like they are being made an example of. We are shocked and appalled by the behaviour of the police on the day both towards us and others. We don’t feel that we were arrested because the officers honestly believed that we were impersonating the police but because we were becoming a thorn in their side. The Space Hijackers were protesting entirely peacefully. In light of the numerous allegations of violence and misconduct against the police that have marred the event, perhaps the biggest joke is the decision to prosecute those peaceful protesters playing loud music and wearing fancy dress. But if evidence from another police impersonation case in Scotland is anything to go by, the Space Hijackers look set for victory. In January, the Daily Mail reported the case of Stuart Kennedy (right), a male stripper who performs under the stage name of Sergeant Eros. Apparently people pay for this sort of thing (again, whatever floats your boat). Anyway, Kennedy had been arrested for the second time for impersonation of a police officer and for the second time had found that the charges had been dropped. Unfortunately, his ongoing battle with Grampian police was far from over: in August, the Sunday Herald reported that the fourth court case against him had just been thrown out. It seems that making a charge of impersonating the police stick when there is obviously no malicious intent has proved harder than prosecutors with no apparent common sense had realised. Put the G20 case in front of jury and it will be laughed out of court. And the great thing is that when the Space Hijackers eventually get to sue the Metropolitan Police for wrongful arrest, the proceeds will be ploughed back into more mischief. It is such a farce. You couldn't make this up!